Because you deserve a comfortable space to get your work done and store your prized possessions. Do you dread working in your pole barn in the extreme Michigan temperatures? Whether it’s your man cave, a workshop, second garage, or extra storage, we help homeowners take back control of the comfort and energy efficiency of their pole barns, metal buildings, and garages. Foam insulation provides the necessary air seal to keep indoor temperatures consistent and regulated all year-round so you're comfortable while you work. Keeping the conditioned air in and the outside air out is more energy efficient and lets you spend more money on the things you love. 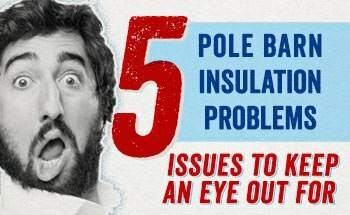 Condensation, moisture, and wood rot are major problems you won’t have to worry about with the proper insulation in your pole barn. 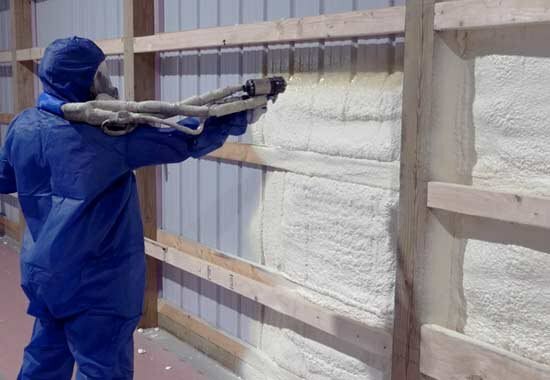 Spray foam insulation is the best choice for keeping a consistent temperature, controlling energy costs, and preventing future problems in pole barns. 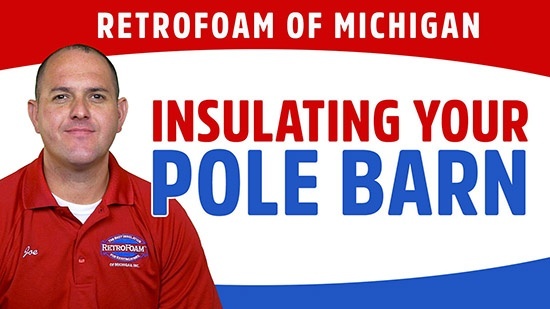 We’ve been insulating pole barns across Michigan’s lower peninsula for the past 15 years. After scheduling your free estimate, we’ll learn about your dreams for your pole barn and if you plan on leaving the walls exposed or finishing with drywall. We’ll discuss open and closed cell spray foam and what makes sense for your project. If the walls of the pole barn will be exposed, then closed cell spray foam is the better option. Closed cell foam is denser and can withstand a blow from a tool or even a forklift. If you plan to cover the walls of the pole barn, then you could use open cell spray foam. Open cell expands to do a better job of filling cracks and crevices. It also offers the same air seal with better sound dampening qualities than closed cell spray foam. To complete the air seal in the pole barn, we suggest spraying open cell spray foam insulation on the roof deck. If your roof should ever leak, open cell foam will not hold water so you will be able to find and fix leaks in a timely manner. 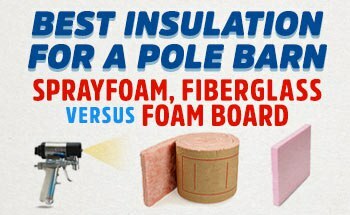 Looking at foam insulation for your pole barn but want to compare all the options? Learn about the pros and cons of the most common insulation materials used to insulate pole barns. 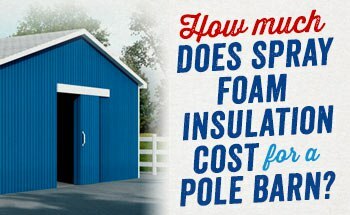 How Much Does Spray Foam Insulation Cost for a Pole Barn? Curious how much it may cost to insulate your pole barn? Read about the factors that impact foam insulation pricing, as well as what you might expect to pay for your project. Problems caused by poor insulation can lead to stress and sleepless nights. Learn what the common problems are and how to avoid them in the first place. How does spray foam compare in price to fiberglass insulation? Spray foam insulation is about two to three times more expensive than fiberglass but creates an air seal that works to regulate the temperature in the pole barn. Fiberglass allows for air leakage, which will lead to higher monthly energy bills as well as an uncomfortable workspace. Learn more. Is open cell or closed cell spray foam better to use in a pole barn? It really depends on whether the walls of your pole barn will be exposed or not. Open cell is great if you plan to put up drywall, while closed cell is a better fit because it is denser if the walls will be exposed. Learn more. Will spray foam rust my metal pole barn? Spray foam itself in most cases won’t rust the metal. We use premium spray foam, so it won’t cause damage to your metal building. Learn more. The size of the structure really determines the amount of time it takes to insulate it. A large structure could take two days or two crews just one day. Learn more. It’s your pole barn, so you can have it insulated any way you want. That being said, if you are looking to create an air seal, you’ll eventually have to do both. Learn more. How does spray foam insulation work for sound deadening? Open cell spray foam is great for sound deadening. It won’t soundproof the building, but it will work to reduce the sound transmission. Learn more. Will spray foam adhere to the metal in my pole barn? Yes, it will. The only time spray foam has an issue sticking to metal is if there is a buildup of condensation. Learn more. Take the first step towards the pole barn you’ve been dreaming of.